Silly Bee's Chickadees: Cafe, Te o Leche, Crema y Azucar? Cafe, Te o Leche, Crema y Azucar? Introducing The Beverage Cart, a unique collection inspired by the lovely and capable flight attendants (men can be lovely too) that take care of us as we take to the skies. 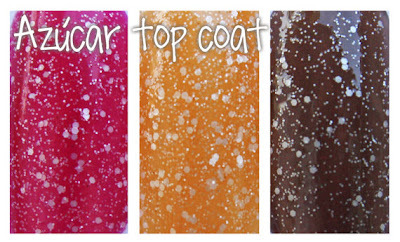 Think of these jelly polishes as undies and outerwear designed to add more flavor to your already beauteous polishes! 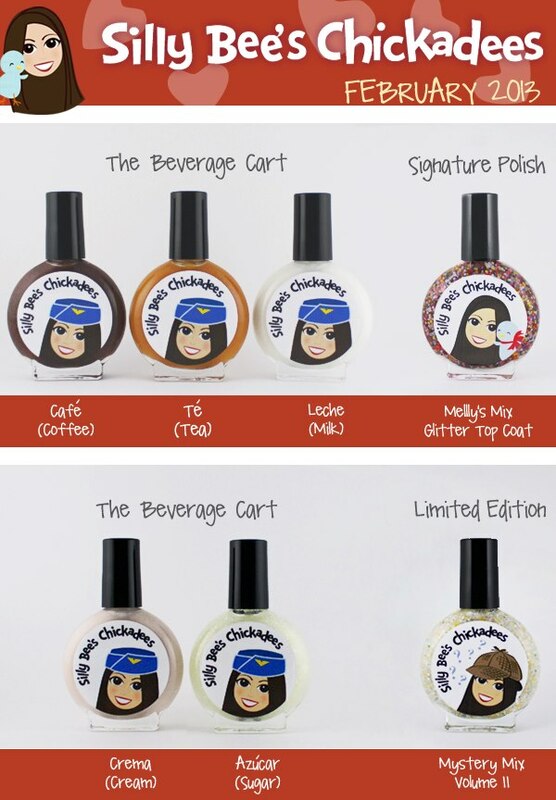 Don't waste those precious one-of-a-kind limited edition indie polishes! As undies, Té and Café serve as primers to help build up a color without using layers and layers of more expensive polishes. And as an overcoat, they're great for jelly sandwiches with glittery polishes. Café and Té in Action! 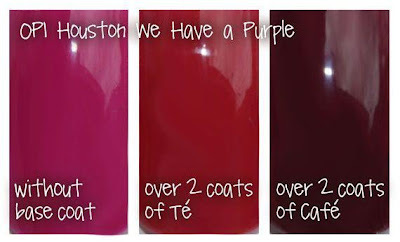 Check out the photo above--wear a couple coats under your favorite jelly to create a totally different polish color! They can turn a cool-toned color into a warm shade in minutes. Leche over Bananamelon Thump Cocktail. 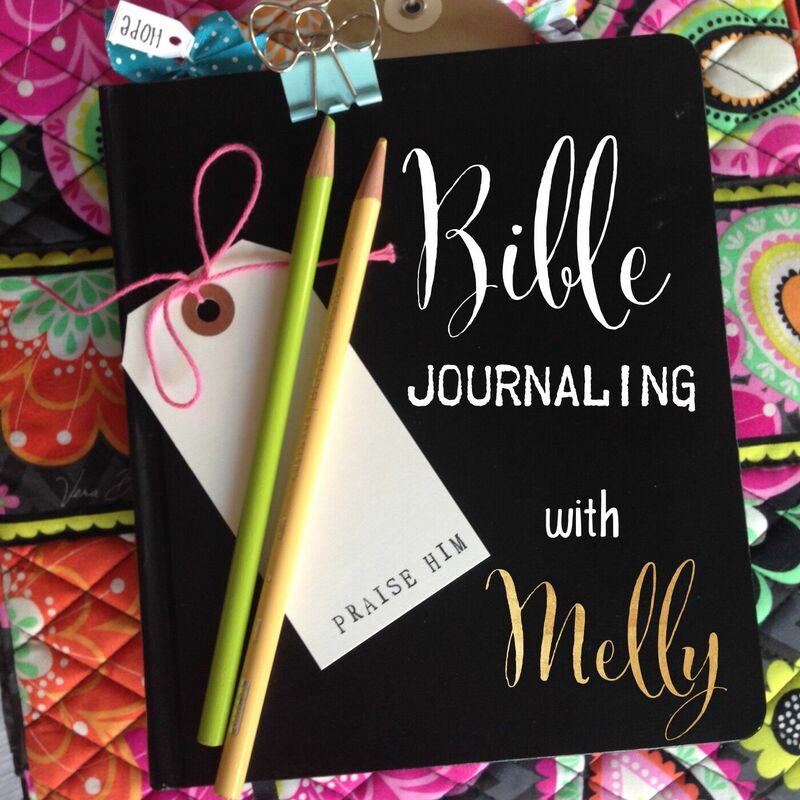 Have you ever had trouble with white-based glitters dragging and streaking? Crema and Leche are the solutions! Use one coat of Leche as a base coat, then one coat of your fave crelly glitter (that would be Bring us a Figgy Mango Smoothie), and finally top it off with a layer of Leche (or Crema). You'll have the smoothest cream crelly/glitter sandwich ever! Café (coffee in Spanish) looks just like a delicious cup of joe. While you can definitely wear Café on its own, I created it to enhance other colors that you already own. Té (tea in Spanish) looks just like a cozy spot of tea. 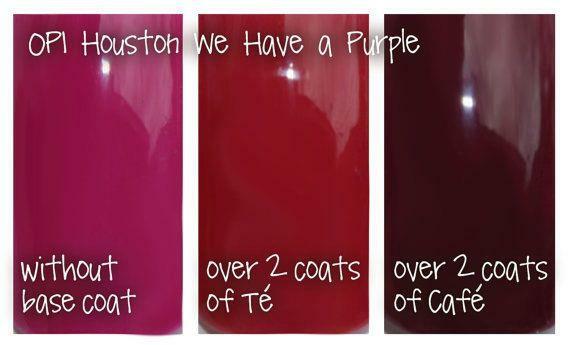 Like Café, you can wear Té on it's own (it's very elegant in 3 coats) or layer it to create dozens of different looks. Leche (milk in Spanish) is a smooth crelly that can be worn on its own, used for jelly sandwiches, AND used as a top coat to smooth over white-based glitter polishes. Finally, Azúcar is a clear top coat filled with slightly transparent hex-shaped matte white micro glitter in two sizes. A coat of Azúcar over your favorite polish is like a sweet dusting of sparkling sugar! It is a little gritty like sugar, so if you want it as smooth as glass, I suggest using the top coat Seche Vite. There are virtually dozens of uses for The Beverage Cart, so buy the full set to extend your polish stash's versatility. At only $5.50 a bottle, it's a great bargain!